Dauer: eine Stunde – Impus ca. 20 min, Dialog ca. 40 min. The impulse will focus on the future possibilities of material and design. Revealing a number of changes mankind might be facing within the next 30 years, the presentation will shift towards the use of advanced materials and highlight the importance of a material literacy to employ these progressively. It will conclude with an exemplary overview of research and student projects. 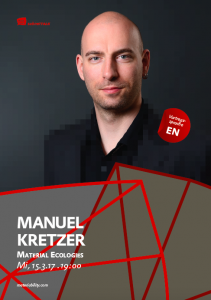 Dr. Manuel Kretzer is currently visiting professor at the Braunschweig University of Art, teaching the subject “Digital Crafting” as well as Studio Master at the Dessau International Architecture Graduate School (DIA). Manuel is the founder of the .materiability research network., an educational platform that provides open access to cutting edge new material developments and technologies. He is also founding partner of .responsive design studio. based in Cologne, a design office that works on various scales, including architecture, interior architecture, landscape architecture, furniture and object design.